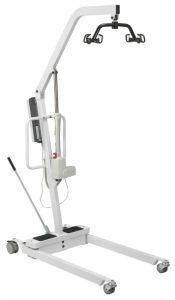 TSH Medical Supply offers Hydraulic & electric patient (Hoyer) lifts and electric standing lift options. All of our rental products can be rented on a weekly or monthly basis. Both Hydraulic and Electric patient lifts are available for rent on either a weekly or monthly basis . Commonly known as a Hoyer lift, our patient lifts are rated for up to 400 lbs and feature lockable caster wheels for safe operation. Slings are not included but are available for purchase. Please call for more details.